Edith Katherine Clifford was born on 27 September 1869 to Henry James Clifford and Annie Frances Hilton-Green. She was always known in the family as Dottie. Home was The Grange overlooking the village green, but the family moved to Lausanne, Switzerland, for an extended stay when she was eleven. There she learnt to speak French, something that was to become useful during her war service. In 1901 Edith was a certificated nurse, boarding at a nurses home in East London. 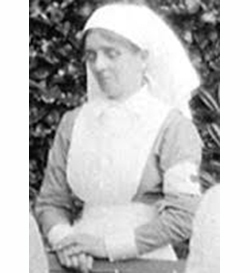 By 1911 she had become a district nurse at a convent in Great Malvern. Edith served on the Western Front throughout the war. Many of the military hospitals were based in châteaux, and the hospital at Longueil-Annel, north of Compiègne was owned by an American lady. This hospital was evacuated for a short time when the German armies swept through, but reopened later. It is believed that Edith's younger sister, Mabel Constance, served alongside her. Edith wore a badge which showed the Red Cross, the name of the château and the American flag, in recognition of its owner. Edith was awarded the highest class of the Medal of French Gratitude by the French government. The blue enamel star her medal bears, is a mark of distinction. The citation records that 'She rendered splendid services at the front and on the lines of communication from October 1914 to January 1919'. After the war, Edith lived in a retreat in Amberley, Gloucestershire. An accomplished musician, she was an inspiration to her family and encouraged a love of music in them. Edith Katherine Clifford died on 14 April 1951 and was buried in St Mary’s churchyard, Frampton on Severn.